The system features a 2.9 GHz Intel Core i7 quad-core processor, 16GB of 2133 MHz LPDDR3 onboard memory, a 2TB PCIe-based SSD, four Thunderbolt 3 (USB Type-C) ports, a 50% larger Force Touch trackpad, a keyboard with a 2nd-gen butterfly mechanism, stereo speakers with double the dynamic range of its predecessor as well as improved bass, 802.11ac Wi-Fi, Bluetooth 4.2 wireless technology, and even a 3.5mm headphone jack. A Touch ID sensor has been integrated into the power button, so you can quickly log into your account, even when another user is logged in. You can also use it with Apple Pay to securely purchase things over the web, thanks to macOS. The 15.4" MacBook Pro runs macOS, which features Siri integration, Universal Clipboard, Apple Pay on the web, and memories in Photos. 15.4" MacBook Pro with Touch Bar (Late 2016, Space Gray) is rated 4.5 out of 5 by 20. Rated 5 out of 5 by brs from Save $1000 and upgrade 8 year old MacBook Pro Yes, it was time to upgrade the 2010 17 inch MacBook Pro that served me so well. ?It still is in use actually, just not my main computer now. ?The new 2016 was just too good to pass up for $1000 off. ?I love the SSD and having 2 TB of space now. ?Apple confirmed that I wouldn't see a difference and if I did it would be minimal in performance. ?I don't miss my 17 inch screen as much as I thought I would and I actually like the Touch Bar and keyboard. ?And it's so light compared to the old warhorse. ?Photoshop and everything else is obviously faster now. ?I still wish they had all the ports like the old days but such is "progress." Rated 5 out of 5 by Anonymous from Exceptional computer; far better than the caviling reviews I updated from a 2012 Retina MacBook Pro, and considering the reviews on these new MacBook Pros I was expecting to be underwhelmed. I knew I would be happy to have more storage, but I had no idea how great the new computer would actually be. 1. The screen is fantastic. The wider color gamut and better default calibration are miles ahead of earlier MacBook Pros. Screen quality is a huge issue for any computer, and the reviews on these new MacBook Pros seem to have just mentioned this in passing. It is a major difference to anyone. 2. The touch bar is very natural and convenient. I would never want to go back to the static function buttons after having the touch bar for a couple of days. Even something as routine as changing screen brightness or volume is much easier on the touch bar. You put your finger on the icon and slide it. No tap tap tap tap tap--you get immediate continuous quick control. 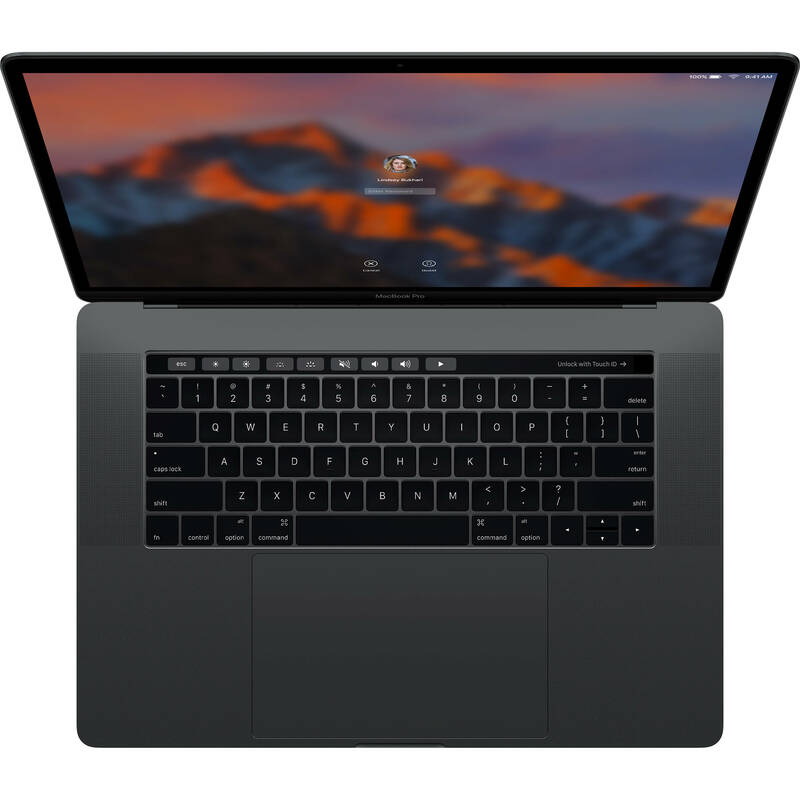 Although I wouldn't buy a new computer to get the touch bar, it is not a gimmick. It is a much better use of space and provides much better control. 3. The addition of Touch ID is also very very welcome. I use a password manager, and opening it with Touch ID is much easier than using my long maser password. Opening the computer with Touch ID is also faster. As with the touch bar, it's a great improvement if not a reason to upgrade on its own. 4. The keyboard backlighting is actually useful. On previous MacBook Pros, the bleeding of light around the keys was really distracting and made the backlighting of limited use to me. The new keyboard completely eliminates this in practice. This is another small improvement that adds up to a big overall upgrade in using the computer. 5. The bigger trackpad opens new possibilities. Without the constraints of the smaller trackpad, I find work faster and easier. I'm resting my palms on the new one while typing and it's not a problem. Again, it's a small improvement but combines with other small improvements to make a big difference. 6. The compromise between thinness, weight, battery life, and speed seem ideal to me. You can definitely get a notebook computer with better specs, but I would not want to carry that computer around. I think Apple got it right. The actual speed in practice (even video encoding withe HandBrake, for example) is terrific. The performance feels to be better than the sum of it's parts on a spec sheet. 7. The adoption of USB-C is simply not an issue. On my previous MacBook Pro I was using an external SD card reader anyway because it read SDXC cards much faster than the internal reader. Everything else just gets a little Anker plug adapter, new cord, or works with USB-C already. It just isn't an issue in practice. 8. The sound is excellent. I greatly appreciate being able to enjoy music on the fly without a bluetooth speaker. I'm extremely happy with everything about this new MacBook Pro. Judging from the reviews I was only going to get more storage by upgrading, but everything about it is very well thought out and better. Rated 5 out of 5 by Mark A from This MBP is outstanding! This is my fourth MPB, I update every 2 years or so. Its construction is absolutely next to none, nicest MacBook construction ever. This is the 15/2.9GHz/16GB/AMD460/2TB SSD. I really didn't expect it to be significantly faster than my 2014 model, but is for sure. I love having all the flexibility of the USB-C capability (Thunderbolt3, USB-3.1 Gen. 2, Displayport, HDMI). of course you need the right adapters, but this thing has enormous potential. Battery is good, I have no issues with it, getting around 8 hours + on normal activity. Keyboard is different, but I like it, you just have to get used to the change. The touch bar to me is also very cool, more applications coming down the road, it not a gimmick as so many have been touting, I think its pretty innovative. Like anything new, you can't expect it to be part of your norm until you've used it for a couple months. Price well that's Apple, but I can tell you I'll be getting a good resale on my previous MBP. Its just a good computer . . Rated 5 out of 5 by Christopher from 2 tb of SSD! I love this machine. I got it in 2018 so its a few generations old. But it still really flies. Having 2tb of ssd was the real blessing for me. I love having all my files with me at all times. When I don't have access to the internet and my cloud drive. I can still get work done. Rated 5 out of 5 by Anonymous from A portable iMac 5k I moved from a fully loaded 5k iMac to this MacBook Pro. Extremely well put together laptop. Screen is amazing - hard to describe how great it is. SSD speed is incredible. Overall very happy with this machine. The only worry was the lack of any ports other than USBC/Thunderbolt 3. This problem has been solved by a handful of very small USBC to USBA adapter for my existing external gear. Rated 5 out of 5 by Robert from Great Laptop Really good laptop. Replaced my old 17" MacBook Pro with this one and its working flawlessly. Great price from B&H and they even met the expired sales price for me. Very happy with this purchase. Rated 5 out of 5 by Gerald from Best Mac I have ever owned. Giving this a 5 star review because it is the nicest, fastest, best user experience Mac I have ever used. That being said I am not sure about the touch bar. I find myself using it more and more so time will tell. Love the key board and track pad. Much lighter than my 2015 MBP. What I love the most about it is the display jumps off the table and things looks beautiful. Placing my 2015 MBP side by side to the space grey 2016 MBP there is a world of difference. The old model the first thing you notice is the keyboard and you eye has to hunt for the display as if the display was an after thought. On the 2016 the first thing your eye goes to is the display. That alone was worth the expense of a new Mac. Think I am going to sell my iPad Pro as this display blows the iPad away and I don't think I will use it anymore. 2TB of storage is expensive but it is lighting fast and I don't have to spend all my time managing space. Battery life is not anything like they advertise. I get about 4 hours of moderate to heavy use working with photos. I imagine if you turn the display down to 50% and just surfed the web you may get 6 or 7 hours but I am not impressed with the battery life. I picked up a second charger for $79.00 only to find out that the usb c cable is not included. What are they thinking? The charging cable was a $35.00 add on. It would be like going to the gas station to buy gas for $2.00 a gallon only to find out you need to rent a hose for $1.00 to get it from the pump to the car. Oh well all in all it is a fantastic machine and I love it! Rated 5 out of 5 by Anonymous from This computer is a beast For being a mobile device, this MacBook Pro is amazing. Super fast, no lag or hanging, and it's got tons of room for my extensive iTunes library and Photos gallery. I even have my iCloud documents all downloaded and still have just over 1TB of space free. With the right accessories, I can still use my USB and Thunderbolt 2 items from my previous 13 MacBook Pro. The screen is huge and sharp and the sound is great! I'm looking forward to the next few years with this thing! The intel core i7, is it of 5th generation or 6th generation processor? Yes, I had 2012 also and was a time to upgrade. Is there a difference between 2.9GHz i7/2TB and 2.9GHz i7/2TB(Special Order? )Do they base on SSD ? Will this render 4K video like the newer model? Sorry, but I dont have any solid idea. However, when I purchased it I did contact Apple to ask them if it is basically the same as the new machine, which they said it was.